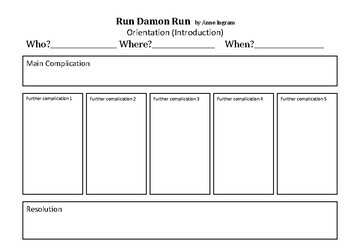 This activity helps students discuss and record the narrative structure of the text- Run Damon Run by Anne Ingram. The activity requires them to firstly identify the who, where when of the orientation. It opens us discussion to explores the main complication and the other multiple complications along the way. Then it requires them to identify the resolution- how the main complication is resolved? This is a helpful picture book to introduce the idea of multiple complications and talk about how novels are put together. It would be a good lead lesson to studying a novel of any kind.